Scott Rogers is an adjunct professor at the University of Southern California. Starting in 2009, he was a frequent guest lecturer at the Interactive Media Division of the USC School of Cinema Arts. 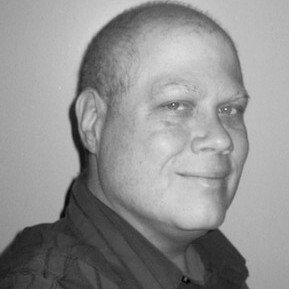 In 2012, he; leveled up to become an adjunct professor and create the new Level Design Workshop with Instructor of Cinema Practice Jeremy Gibson, where students develop their artistic voices as level designers and teams work rapidly to develop innovative experiences and tell stories using virtual worlds. Scott Rogers received two Bachelor of Arts at California State University at Long Beach - Radio, Television and Film production and Fine Arts in 1992. Prior to joining the USC faculty, Scott worked in the video game industry since 1993 as a game designer, artist and creative manager on over 50 unique game titles including: Pac-Man World 20th Anniversary (Namco), Ms. Pac-Man Maze Madness (Namco), Soul Edge (Namco), Maximo: Ghosts to Glory (Capcom), Maximo vs Army of Zin (Capcom), God of War (Sony), Drawn to Life (THQ), SpongeBob Squarepants (THQ), Darksiders (THQ), Red Faction: Armageddon (THQ). Scott currently works for Walt Disney Imagineering on an unannounced project. In addition to his recent teaching, Scott was awarded a donation by Sony to create a course to teach game design at EARTHs academy in Newbury Park, CA. He has authored (and drew!) two critically reviewed books on game design: Level Up! The Guide to Great Game Design (2010) and Swipe This! The Guide to Great Touchscreen Game Design (2012) and his comic book, Bedbug, will be published in Spring 2013.